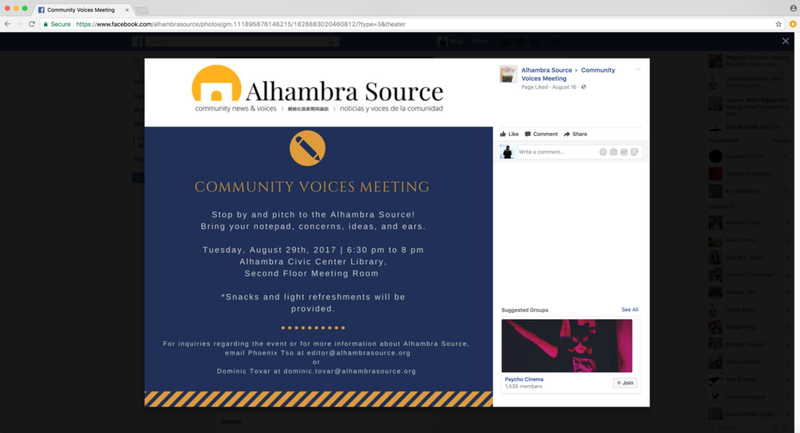 We had the pleasure of speaking about filmmaking at the Alhambra Source’s Community Voices meeting on Tuesday, 8/29/17 at the Alhambra Civic Center Library. We appreciate the opportunity to share our thoughts about our work. Thank you again to Phoenix Tso, Managing Editor of Alhambra Source, Dominic Tovar, Community Outreach Coordinator of Alhambra Source, and everyone who attended the meeting. We’re excited to speak about filmmaking at the next Alhambra Source Community Voices Meeting. According to their website, “The Alhambra Source is the only local news website dedicated to coverage of Alhambra, a multiethnic Los Angeles suburb of 86,000 and the gateway to the San Gabriel Valley.” They explain, “Community engagement is the core of what we do, collaborating with local organizations, businesses, and residents.” We’re proud to be based in Alhambra and appreciate Alhambra Source’s in-depth coverage of our great city. Thank you to Phoenix Tso, the managing editor of Alhambra Source, for this wonderful opportunity. Tuesday, 8/29/18, 6:30 p.m. - 8:00 p.m. Copyright © 2015-2019 Humanist Films, LLC. All rights reserved.